Aerojet LOx/LH2 rocket engine. Study 1961. Engine developed 1962-1966 for Uprated Saturn and Nova million-pound payload boosters to support manned Mars missions. Reached component test stage before cancellation. AKA: AJ23-146. Status: Study 1961. Thrust: 5,335.90 kN (1,199,558 lbf). Unfuelled mass: 9,068 kg (19,991 lb). Specific impulse: 428 s. Specific impulse sea level: 310 s. Burn time: 250 s. Height: 7.72 m (25.32 ft). Diameter: 4.28 m (14.04 ft). Aerojet, the perennial loser in NASA large engine competitions, finally felt itself a winner when it received the hotly contested contract to develop the M-1 liquid oxygen/hydrogen engine for post-Saturn launch vehicles (Uprated Saturn and Nova). These would be used in the million-pound payload boosters required in the 1970's to support manned Mars missions and lunar colonies. The $238 million contract for the M-l (NASA/LeRC number NAS 3-2555) was issued on April 30, 1962. The technological leap involved was tremendous - at that time the only Lox/LH2 engine in the flight-test stage was the 6,800 kgf Pratt and Whitney RL10. But Aerojet brought substantial experience to the contract. They had demonstrated a 1,360 kgf Lox/LH2 engine as early as 1948. Starting in 1958 Aerojet had developed a Lox/LH2 version of the Titan 1 LR87 engine with a thrust of 68,000 kgf, although this used a completely different technology from that planned for the M-1. Other related Aerojet work included the 23,000 kgf NERVA nuclear thermal engine. Work had been underway on this since 1960, but it used only liquid hydrogen and did not address combustion or oxygen pumping. Dan Price directed this remarkable program, which included Dr. John Moise, Hal Campen, and Ken Unmack in key roles. Unmack remembered, �The M-l size took months to get used to. We couldn't draw anything full-scale. We were just getting used to all this when the program started winding down'. Work was slowed down by reduced funding levels within a year of the initial award, due to priority of the basic Saturn V for the Apollo moon landing. Within three years NASA's hopes for a massive post-Apollo program had faded, and the M-1 contract was concluded on August 24, 1965. The last M-1 test was run in August 1966, with cleanup activities extending into 1968. The innovations and technology of the M-1 were helpful to NERVA, and 25 years later, to the STEP shuttle engine improvement program. 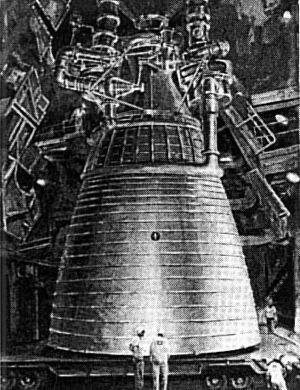 The M-1 was a single chamber LOX/LH, unit designed initially for 545,000 kgf vacuum thrust, and later uprated to 680,000 kgf. It used a simple gas generator cycle with separate hydrogen and oxygen turbopump assemblies. The nozzle expansion ratio of 40:1 was appropriate for altitude operations, and its relatively high chamber pressure of 1000 psi contributed to its vacuum specific impulse of 430 sec. Nominal duration was 400 seconds (with total operational qualified life of 3000 seconds), the unit weighed 9,000 kg and measured 8.15 m in height and 5.39m in diameter. A unique feature was that the nozzle exit cone was cooled by the turbine exhaust gases from the 14:1 area ratio point to the exit. The remainder of the nozzle and the thrust chamber were regeneratively cooled with the liquid hydrogen. Total turbopump shaft power was on the order of 100,000 horsepower. Although the M-1 never reached the phase of all-up engine test, it remains the largest hydrogen/oxygen thrust chamber assembly ever tested. Propellant consumption was over 100 metric tons (two tank car loads) per minute. During hydrogen pump testing it was totally impractical to recapture the pumped hydrogen. Therefore it was simply flared. The first test was at night produced what was the world's largest and most startling flare. The Lox/LH2 LR87 had used impinging stream injectors and single stage pumps. The M-l had coaxial injectors and over ten stages in the fuel pump. The hydrogen pump was rated at 75,000 horsepower and was operated at more than 90,000 HP during testing. Injectors (several configurations fabricated, but only one version was tested). The feasibility of all major M-l engine components was demonstrated (except for the cooled chamber and the gas cooled skirt). Major facilities for testing the fuel and oxidizer turbopumps, as well as the thrust chamber assembly were constructed and successfully operated. Thrust (sl): 3,864.800 kN (868,842 lbf). Thrust (sl): 394,104 kgf. Engine: 9,068 kg (19,991 lb). Chamber Pressure: 69.00 bar. Area Ratio: 28. Thrust to Weight Ratio: 60. Country: USA. Launch Vehicles: Nova 4S, Nova 7S, Nova 8L, Nova MM 14A, Nova MM 14B, Nova MM 1B, Nova MM 1C, Nova-1 DAC, Nova-2 DAC, Nova GD-E, Nova GD-F, Nova GD-J. Propellants: Lox/LH2. Stages: Astro-1, Nova 60-8-2, SLS Stage C, Nova DAC 2-1, Nova DAC 2-2, Nova DAC-2, Nova GD-E-2, Nova GD-F-2, Nova GD-J-2, Nova MM 14A-2, Nova MM 14B-2, Nova MM 1B-2, Nova MM 1C-2. Agency: Aerojet. Bibliography: 480.